The Ducks and Gonzaga are doing a good job of representing western programs, just as they did in 2017. Changing the perception of the Pac-12 will take more than having one men's basketball team reach the Sweet 16 of the NCAA Tournament, but this is a good start. 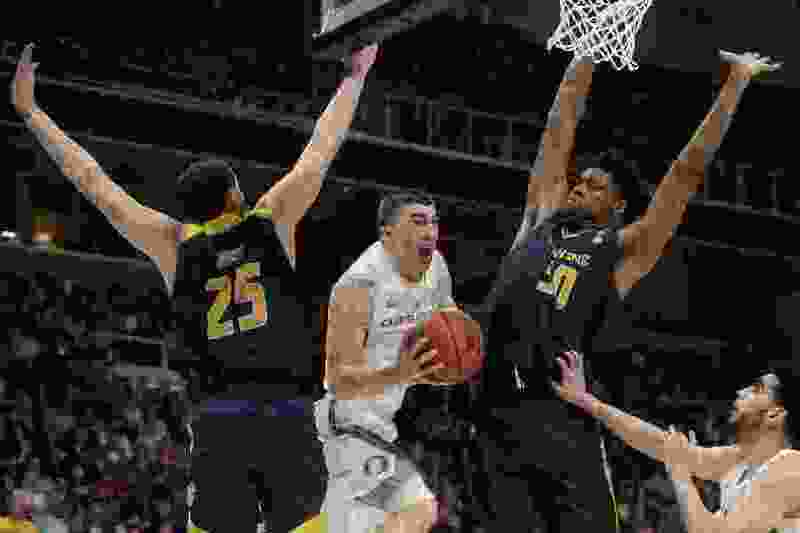 Oregon's two dominant performances this past weekend extended the Ducks' surge that began at the end of the regular season and continued through the Pac-12 tournament. A team that once stood 6-8 in conference play and finished in a tie for fourth place, one game behind Utah, is salvaging the basketball season for a league that needs some credibility in flagship sports. And just as happened in 2017, when both schools made the Final Four, the Ducks are joining Gonzaga to give the West some distinction. Counting a First Four win by Arizona State, the Pac-12 is 4-2 in the NCAA Tournament. That’s a breakthrough for a conference that went 0-3 last March, failing to reach the round of 32 for the first time in 32 years, followed by a 3-4 showing in football bowl games. Regular-season champion Washington’s first-round defeat of Utah State and Oregon’s decisive wins over No. 5 Wisconsin and No. 13 UC Irvine have restored some competence to the conference. The Ducks will meet No. 1 Virginia in the South Region semifinals Thursday. No. 1 Gonzaga vs. No. 4 Florida State at Anaheim, Calif., 5:09 p.m.
No. 12 Oregon vs. No. 1 Virginia at Louisvile, Ky., approximately 8 p.m.
“As we all know, it’s Oregon’s defense that’s put them in the position they’re in right now,” Utah coach Larry Krystkowiak said after the Ducks stymied his team in the Pac-12 quarterfinals, winning 66-54. Oregon guard Payton Pritchard, who hurt Utah in the second half of that game in Las Vegas, is averaging 18.5 points and 7.5 assists in NCAA play. Altman and the Ducks have figured it out. They've overcome injuries to forwards Louis King, Kenny Wooten and Paul White that derailed them in December and January, after they already had lost center Bol Bol for the season. Oregon is by far the lowest remaining seed in a tournament that has rewarded schools from the Power Five football conferences and those that performed well all season. No. 5 Auburn, having advanced from Vivint Smart Home Arena with a convincing win over No. 4 Kansas, is the only other Sweet 16 team seeded outside of the top four. No. 1 Gonzaga, via its West Coast Conference membership, is the only non-football, mid-major program left in the field (Houston also is from outside of the Power Five). Big West champion UC Irvine had eliminated No. 4 Kansas State in the first round, producing the tournament’s biggest upset, after the Western Athletic Conference’s New Mexico State missed a great chance to knock off Auburn. College basketball in the West has made a mild comeback in 2019, even though the Mountain West co-champions (Nevada and Utah State) lost in the NCAA’s first round. As some degree of consolation, the Utes can say they went 10-3 in Pac-12 play, disregarding the opponents that won NCAA games. And their showing in the conference tournament made them victims of an Oregon defense that’s doing the same thing to a bunch of other teams.